Below are some local area links with information on the city, borough, neighborhood and local attractions including schools and much more. If you have local links to suggest to us please contact us so that we can add them to our site. We appreciate your help in trying to provide the most current and useful information we can provide. A unique new addition to the Inwood neighborhood. Featuring hand made gifts, crafts and artwork - much of it from local artists and crafts people. A great place to find a special gift for your loved ones or for yourself! Exceptional coffee drinks and baked goods in an inviting space that can be a community meeting place for all that live, work and enjoy the neighborhood. 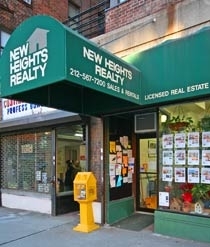 The Washington Heights Inwood Coalition was established in 1978 by religious, educational, and business institutions refecting the diversity of northern Manhattan. THE MISSION OF UP THEATER COMPANY is to present fully produced, professional theater to its community in Northern Manhattan, employing many local artists who call this corner of the city home. Despite our parochial concerns, UP is no “community theater.” We eschew crowd pleasing chestnuts in favor of new work that challenges our audience’s preconceived notions of who they are and what they think they think; work that is relevant to our Uptown urban environment and unafraid to be gritty, rambunctious and irreverent. Ultimately, we envision a theater that will be a destination for theatergoers from all across the area, drawn by work of quality and passion. How to get there in the city. The go to pet store in Inwood ,Washington heights area. Furry Fiends offers the best pet supplies, services, and expertise to help you care for your best companion. All natural and holistic pet food and supplies. Free delivery offered at costumer's convenience. A Reform synagogue serving Washington Heights and Inwood in northern Manhattan.